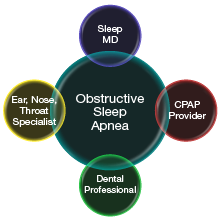 MAXFACS Dental Sleep Medicine Professionals use an integrated approach to the treatment of sleep-related breathing disorders. Collaboration with a diverse field of healthcare providers allows patients to access a wide range of treatment options. Treatment is individually tailored to the needs of each client and the nature and severity of the disorder.